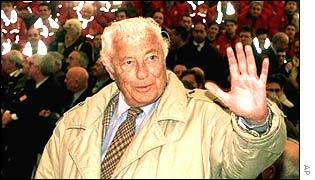 Gianni Agnelli, the honorary chairman of Fiat and one of Europe's most prominent tycoons, has died. Mr Agnelli, 81, was arguably the most influential Italian business leader of the 20th century, building Fiat up from a small carmaker into a sprawling industrial and financial conglomerate. Italian Prime Minister Silvio Berlusconi paid tribute to him as "a leading figure in Italian life for more than half a century" while President Carlo Azeglio Ciampi said his death left "a great vacuum on the Italian scene". Mr Agnelli's death came only hours before he was due to chair a gathering of his family to discuss the future of Fiat. But investors appeared anything but saddened by the news, as shares rose on the prospect that Mr Agnelli's death could lead to a more dramatic restructuring of the debt-laden company. Mr Agnelli had been staunchly opposed to a sale of Fiat, despite the company's losses mounting to almost 3bn euros ($3.2bn; £2bn). The carmaker's biggest struggles were in its Fiat Auto division, where a slump in demand led to calls for a thorough shake-up. "Agnelli was seen as the strongest proponent of keeping the auto division in family hands," said one analyst in Germany. His death sent shares up more than 4% at the start of trading as analysts suggested that there could now be a sale of Fiat Auto to the US group General Motors. GM owns 20% of Fiat Auto, and the Italian car maker has the option of forcing it to buy the remaining 80% from 2004. The Agnelli family, based in the north Italian city of Turin, owns about 30% of Fiat. They also control Juventus football club and Formula One champions Ferrari. Mr Agnelli was instrumental in Ferrari's return to the top in the late 1990s after years in the wilderness - it was Gianni Agnelli himself who persuaded Michael Schumacher to join the team. On Friday afternoon, the Agnelli family's holding company said Umberto Agnelli would replace his older brother as its chairman. "Agnelli was often called Italy's uncrowned king"
"The Agnelli family... wanted to keep [Fiat] within the family for as long as possible"
"He lived in a period in which Italy was pretty protected"